I’ve always wished for a feature in a mail client that would let me say, “Only keep mail in this folder for ___ days,” after which point it would just be automatically deleted. 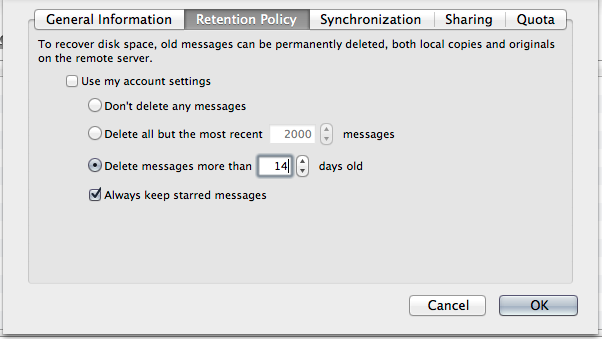 I filter mail from mailing lists into individual folders, and mail can get out of control quickly if I don’t watch it. I’ve searched a few times for Thunderbird extensions to do this, and was always surprised that none existed. In the back of my mind, I figured I’d have to write my own. Today, I realized why this plugin doesn’t exist. It’s because it’s a native feature in Thunderbird.